We’re getting close to the new year! Are you looking forward to setting new goals? Or is it dreary and awful? As we approach the end of the year, it’s traditionally time to start thinking about goals, though it’s always a good time to do so. That is, unless you plan on not achieving them. If so, never mind. DIG stands for Discover, Implement and Gather, and I use the mnemonic as a framework to live, plan, and evaluate my life. In the next few posts, I’ll be going into each of these in some detail, but for now lets just touch at the surface what I mean by them. By remembering DIG you will be able to see yourself in a process, feel grounded that you have a path forward, and that you have some mechanism to claim your life as your own, not someone else’s. Discover – This process is about dreaming. What are the goals you’re after? What is stopping you? One thing I’ve used for the discovery process that really works, especially for those folks who are more visual than not, is mind mapping. Mind mapping is the art of taking ideas and writing about them spatially. Just a couple of tips here. Keep the bubbles small (one or two words) and don’t try too hard to make sense of it. This isn’t an outline. Draw pictures, be silly, be outlandish. And shoot high! According to Gretchin Rubin, studies show that those big goals tend to motivate people more than smaller, more achievable goals. Jim Collins calls this concept BHAG – Big Hairy Audacious Goal. Create that mindmap without goals in mind at first – just radiate out what you feel, in images and symbols. The idea is that we’re tapping something deeper and non-linear in our minds. 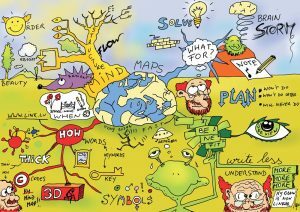 Here’s a video by one of the originators of Mind Mapping – Tony Buzan. Implement – is about execution – now you gotta do it. It is where we see LifeSparcs, the journal/app, being used. Week by week, tough task by tough task, we get there. Yet, for rebels like me, scheduling doesn’t work – I rebel against the notion itself. Therefore for us rebels, create that list, free of dates, and put stars or something to indicate priority. Then when you review the list, you can do whatever you choose of it since you already prioritized it. Gather – Despite doing this every week ( this is the C in SPARC), its also a good practice to have a bigger picture review with yourself or your coach. The forest now, not the trees. How are you feeling the thing you’ve been trying? Has the weight loss gone okay? How about that book you’re writing? Have you gotten much feedback? Is it time to try that new thing? Or, should you give it another go? Another chunk of the LIfeSparc effort, to see if it’s YOUR thing. Gather is a chance to say, we’re doing okay. We’re gonna be alright. This is the chance for us to enjoy the music of life, regardless of the outcome of what we’ve done. Action Step: Try mind mapping! Get out a few pieces of 8×11 white, unlined paper, and have at it. Doing this step will line you up well for the next part of the process – Implement.